Adele Perry, "On the Edge of Empire: Gender, Race, and the Making of British Columbia, 1849-1871"
"On the Edge of Empire" is a well-written, carefully researched, and persuasively argued book that delineates the centrality of race and gender in the making of colonial and national identities, and in the re-writing of Canadian history as colonial history. Utilising feminist and post-colonial filters, Perry designs a case study of British Columbia. She draws on current work which aims to close the distance between 'home' and away in order to make her case about the commonalities and differences between circumstances in British Columbia and the kind of 'Anglo-American' culture that was increasingly dominant in North America, parts of the British Isles, and other white settler colonies. 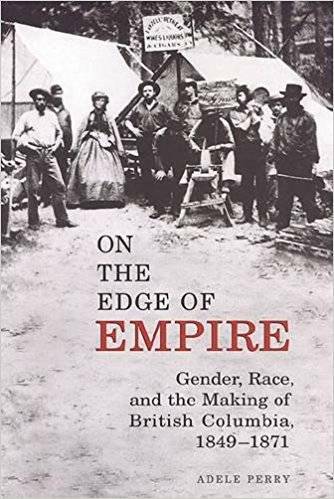 "On the Edge of Empire" examines how a loosely connected group of reformers worked to transform an environment that lent itself to two social phenomena: white male homosocial culture and conjugal relationships between First Nations women and settler men. The reformers worked to replace British Columbia's homosocial culture with the practices of respectable, middle-class European masculinity. Others encouraged mixed-race couples to conform to European standards of marriage and discouraged white-Aboriginal unions through moral suasion or the more radical tactic of racially-segregated space. Another reform impetus laboured through immigration and land policy to both build and shape the settler population. A more successful reform effort involved four assisted female immigration efforts, yet the experience of white women in British Columbia only made more pronounced the gap between colonial discourse and colonial experience. In its failure to live up to British expectations, remaining a racially plural resource colony with a unique culture, British Columbia revealed much about the politics of gender, race and the making of colonial society on this edge of empire. Winner of the Clio Award, British Columbia Region, presented by the Canadian Historical Association, and co-winner of the Pacific Coast Branch Book Award, presented by the American Historical Association.